(or Vitamin B12), C63H88CoN14O14P, a cobalt-corrin complex in which the cobalt atom is bonded to a cyano group, a nucleotide residue, and four reduced pyrrole rings; molecular weight, 1355.40. Cyanocobalamin is a dark-red crystalline compound, which is soluble in water and polar organic solvents. It was first isolated in crystalline form from cattle liver. Its structure was established by A. Todd and D. Crowfoot Hodgkin and their co-workers. 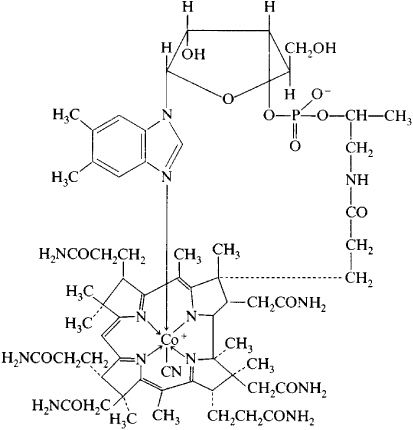 The primary sources of cyanocobalamin in nature are microorganisms; cyanocobalamin is synthesized by several bacteria, by actinomycetes, and by blue-green algae. It occurs in almost all animal tissues. It is not encountered, as a rule, in the tissues of higher plants (legume tubers are an exception). In ruminants, it is synthesized in sufficient amounts by the microflora of the intestine and the rumen. In man and several higher animals, such as birds and hogs, its synthesis by intestinal microflora is insufficient, and thus the vitamin must be obtained from food. The daily requirement for humans is about 5 μg. The major sources of the vitamin are liver, kidneys, fish meal, and milk. In the form of its coenzymes methylcobalamin and deoxyadenosylcobalamin, cyanocobalamin participates in the enzymic reactions involved in hematopoiesis and facilitates normal liver function and nerve fiber regeneration. It is produced by microbiological synthesis using propionic-acid bacteria for the fermentation process. Friedrich, W. Vitamin B12 und Verwandte Corrinoide, 3rd ed. Stuttgart, 1975. Vitamin B12 is involved in homocysteine metabolism; lacking sufficient B12, homocysteine levels can rise. Sample size was calculated to be 90 (45 in each group) estimated by using 5% level of significance and 90% power of test with expected percentage of B12 deficiency with GDM as 51. However, studies evaluating vitamin B12 status in obese children are rare. Cuando se evalua con neuroimagenes a los pacientes con deficit de vitamina B12 se observan hiperintensidades periventriculares y subcorticales (leucoaraiosis), atrofia cerebral e infartos silenciosos (4,10,11). Vitamin B12 is important for keeping your nails, hair, and skin healthy. Second, our study was based on serum B12 results, which alone, without other biochemical markers such as homocysteine, methylmalonic acid might not be accurate measures of B12 deficiency. The cause was lack of vitamin B12 in his bloodstream. Excessive folate, B12 in pregnancy dramatically ups autism risk [online article], Medscape Medical News. Do folic acid and vitamin B12 cause autism? These patients were investigated for CBC, Peripheral smear, Serum ferritin, serum folate, serum vitamin B12 and bone marrow specimen being taken by a consultant pathologists under strict hygienic condition. Homocysteine was lowered by 22% in the vitamin B12 group, 19% in the fish oil group, and 39% among those who received both supplements for eight weeks. Vitamin B12 plays a vital role in ensuring the production of healthy red blood cells. These are particularly significant findings because the differences we found in brain B12 with aging, autism and schizophrenia are not seen in the blood, which is where B12 levels are usually measured.